John J. Nee Sr., 97, passed away peacefully on Sunday, Jan. 7 at TrustBridge Hospice Center in Pompano Beach, Fla. Born in Trenton, N.J., John’s family eventually moved to Jersey City, where he had spent most of his childhood until he graduated from high school. In 1942, John joined the U.S. Army-6th Armed Division as a Private First Class during World War II, fighting for the Battle of the Bulge campaign where he received an American Service Medal. In 1945, once out of the military, John worked as a purchasing agent for Western Electric. During this time, John had married Olga Stojanowski and they eventually moved to Staten Island, N.Y., in 1947, where they had a son, John J. Nee Jr.
John had many interests. He enjoyed bowling, fishing, and traveling to Florida, but especially spending time with his family. He was a member of the World War II Veterans-Battle of the Bulge-Staten Island Chapter 52 and West Palm Beach-Chapter 62. 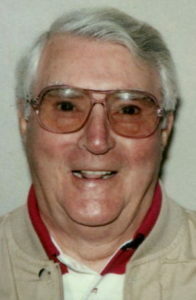 John was predeceased by his wife, Olga, in February 2000, his brother, Thomas Nee, and sister, Fran Nee Ahearn. John is survived by his loving son, John Jr. and his daughter-in-law, Ruth; beloved grandchildren, Daniel and Brian Nee; two loving great-grandchildren, Austin and Logan Elizabeth Nee, and his dear friend and valued companion, Efrain Campomenosi. Funeral from Cherubini McInerney Funeral Home at 9:15 a.m. on Friday. A Mass of Christian Burial to be held at St. Adalbert’s R.C. Church at 10:30 a.m. followed by a burial at St. Peter’s Cemetery. Viewing will be on Thursday from 4 to 8 p.m.
Offer Condolence for the family of John J. Nee, Sr.